Don't go downtown during rush hour, which is basically all the time. But if you do make it, stop at this little tourist block that was the original center of Los Angeles in Spanish-owned times. Amidst the souvenir shops (Mexican wrestling masks! Scarface posters!) is Mr. Churro, where you should get a caramel-filled churro. You can also eat at one of the good Mexican restaurants here, or you can go a block over and get the amazing lamb French dip sandwich at Philippe's, the sawdust-covered counter restaurant that's been around since 1908. Or drive a few blocks to Langer's, where to everyone's shock they make a better pastrami sandwich than any deli in New York City. The secret is that L.A. is actually more Jewish than Manhattan. 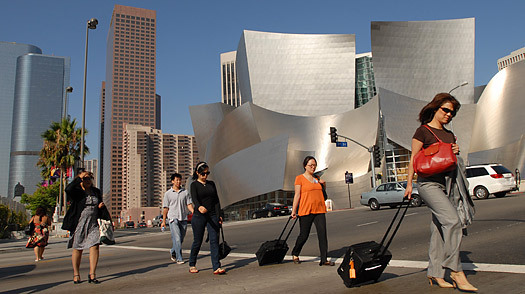 Walk off lunch by heading to the curvy, metal Gehry-designed Walt Disney Concert Hall and the Cathedral of Our Lady of the Angels, the new church  who knew they were still building churches?  that redefines Catholic grandiosity by using restraint.